The sternum or breastbone is a long, flat, bony plate connected to the rib bones via cartilage that forms the anterior section of the rib cage. The sternum, or breastbone, is a long, flat, bony plate that forms the most anterior section of the rib cage. The primary function of the sternum is the protection of the heart, lungs, and blood vessels from physical damage. The sternum is made of the manubrium, the gladiolus, and the xiphoid process. xiphoid process: The most inferior region of the thorax. gladiolus: The body of the thorax. 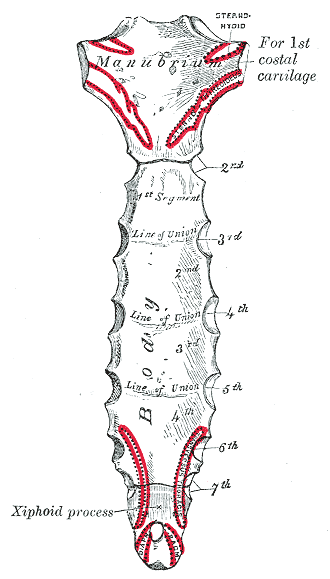 manubrium: The most superior region of the thorax. The sternum, or breastbone, is a long, flat, bony plate that forms the most anterior section of the ribcage. The sternum is highly vascular in nature and covered with a thin layer of compact bone providing a degree of flexibility. Sternum: This image shows the parts of the sternum. Together with the anterior ribs, the sternum helps to protect the heart and lungs from damage, as well as facilitates the expansion and contraction of the thoracic cavity during respiration. During development the sternum is comprised of four individual sections called sternebrae, which fuse to form the sternum in adulthood. The manubrium is the most superior region of the sternum and articulates with the clavicles or collarbones and the first pair of ribs. The manubrium is the thickest portion of the sternum as it carries the greatest physical load. The thin, pointed xiphoid process forms the most inferior region of the sternum to which the costal cartilage and cartilage of the celiac, or solar, plexus attaches.